Part of our larger EventSentry network-management solution, the freeware EventSentry SysAdmin Tools offer a set of graphical and command-line utilities designed to help you with your daily administrative tasks. These tools are constantly under development, always being honed to provide simple yet powerful functionality. Three of these tools are vital security utilities: Password Assistant, Service Secure, and Task Secure. Let’s take a look at what they offer. Password Assistant is a simple yet powerful tool that lets you update the passwords of user accounts on multiple Windows machines. You simply enter the username, the old password, and the new password (with confirmation); after doing so, you can select the computer name(s) from a network neighborhood list (with a filter option) or choose the computer(s) from a text file. 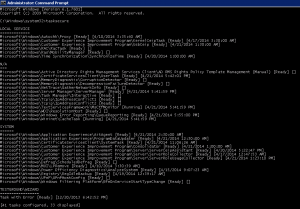 The update process can also be logged to a text file. All the param eters of the command-line utility are provided in clear terms: The /u (or /username) parameter specifies the username whose password needs to be changes, the /pwold parameter takes that account’s old password, and the /pwnew parameter accepts the new password; there are also /n (or /network), /f (or /filepath), and /filter parameters for specifying computers, as mentioned above. The /ignore_rest parameter ignores the rest of the labeled arguments following this flag, and the /version parameter displays version information and exits. A great sample use of Password Assistant is when you need to update the administrator passwords on all of the workstations in your environment. Password Assistant provides a one-stop interface—or a simple command-line utility—for making the task hassle-free. 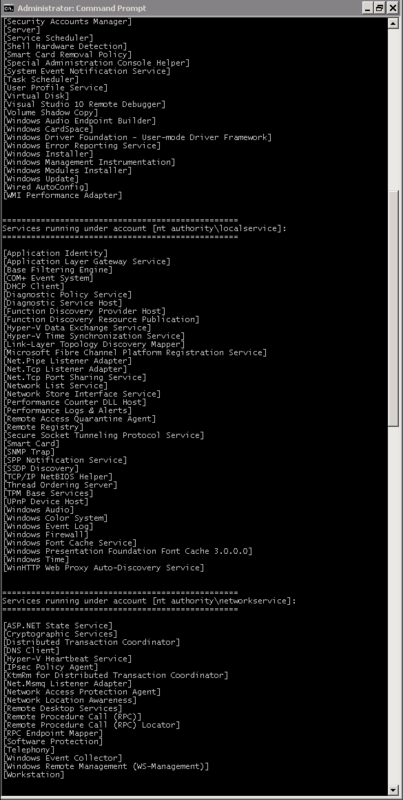 Service Secure provides a simple command interface that displays all of your system’s services, grouped by service account. 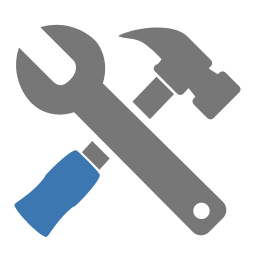 The tool also lets you easily reset service passwords by specifying username and password rather than having to manually configure those services through the Microsoft Management Console (MMC). All the parameters of the command-line utility are provided in clear terms: The /p (or /password) parameter sets a password; the /c (or /changepwd) parameter changes a password; the /r (or /restart) parameter restarts the service after the password has been changed; the /u (or /username) parameter lists only those services running under a certain username; the /ignore_rest parameter ignores the rest of the labeled arguments following this flag; the /version parameter displays version information and exits. Suppose service security has been compromised, and you need to quickly change the passwords of a user account used by a number of services. That task is no longer a logistical nightmare: You can now simply use ServiceSecure in a batch file and update all affected services in your entire network in a matter of moments. Task Secure provides a simple command interface that displays all of your system’s scheduled tasks, grouped by task account. The tool also lets you easily manage the passwords stored in scheduled tasks on your network. 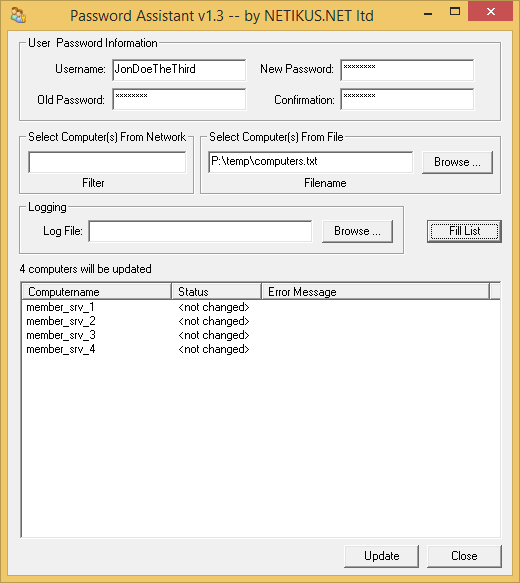 Simply specify the username and password, and Task Secure will reset the password stored in all scheduled tasks (using the specified username) on the specified computer (local or remote). 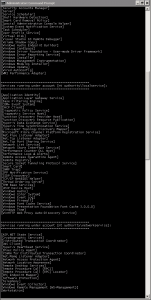 All the parameters of the command-line utility are provided in clear terms: The /r (or /remote_host) parameter lists all the scheduled tasks on a given host; the /u (or /username) parameter lists only those scheduled tasks running under a certain username; the /p (or /password) parameter sets a password for every scheduled task configured for a certain user account; the /ignore_rest parameter ignores the rest of the labeled arguments following this flag; the /version parameter displays version information and exits. 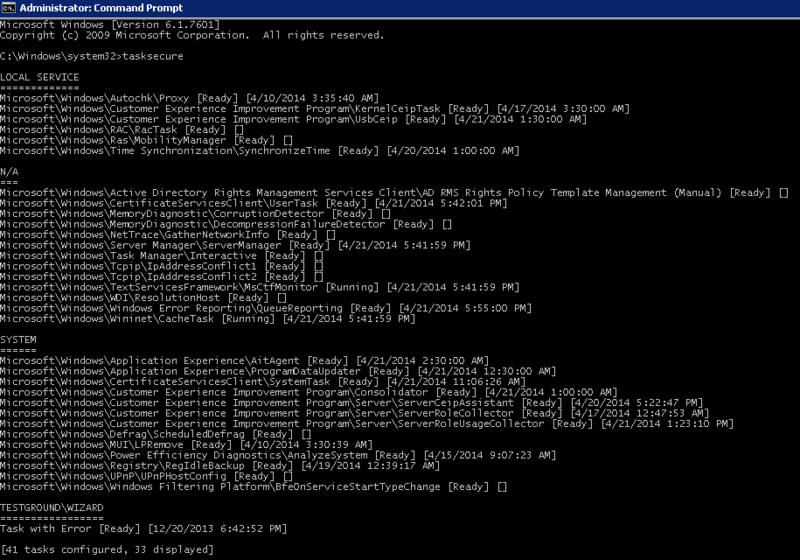 Suppose you need to quickly change the passwords of all the scheduled tasks used by one user. You can now simply use Task Secure in a batch file and update all scheduled tasks in your entire network in a matter of moments. This is just a taste of the free, constantly evolving tools available in EventSentry SysAdmin Tools. Give them a try—you won’t be able to stop with just one.